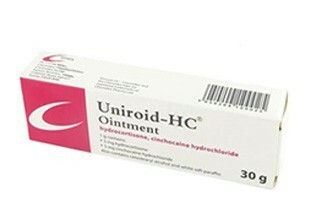 Uniroid HC is a combination of two active ingredients, being cinchocaine hydrochloride and hydrocortisone. Cinchocaine hydrochloride is a local aneasthetic and causes pain relief. Hydrocortisone is a corticosteroid which reduces inflammation, itching, pain and swelling. Available in: ointment and suppositories.